Personalised and Engraved Optical Crystal Bud Vase measuring 12cm high. 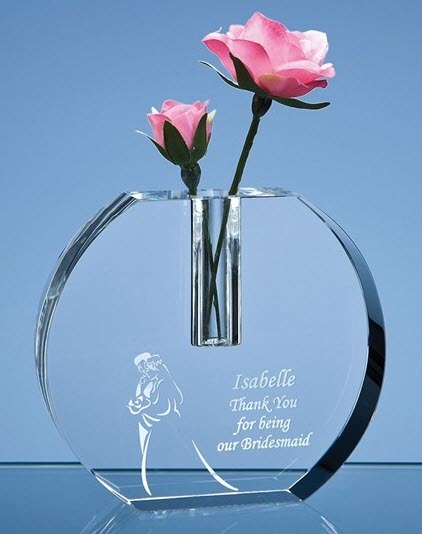 The vase has a variety of different uses from a personalised table decoration to a useful 'Thank You' gift. There is a large engraving area that can be personalised with with any image, logo or wording to create a gift that is sure to take pride of place when put on display at home or at work. It is supplied in a black foam lined presentation box. This is a solid crystal amazing gift! Ideal present for Birthdays, Weddings, Anniversaries...it's endless!